Jim Mooney | The Fantastic Flame On! 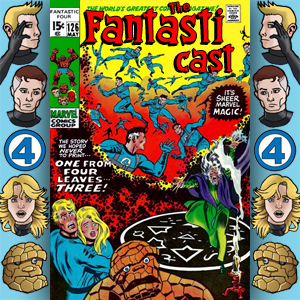 This week, we’re taking a look at Fantastic Four #118, as Johnny Storm tries to undo Crystal’s brainwashing, Diablo plays with his chemicals, and Ben Grimm takes a journey to Earth-A, where everyone looks like Reed, except… Reed? We’re also taking a look at Sub-Mariner #45. I say we… does anyone have anything they want to confess? 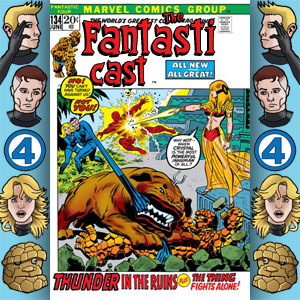 Much like Breaking Bad, this episode of the Fantasticast is all about Crystal (I apologise for that terrible joke). 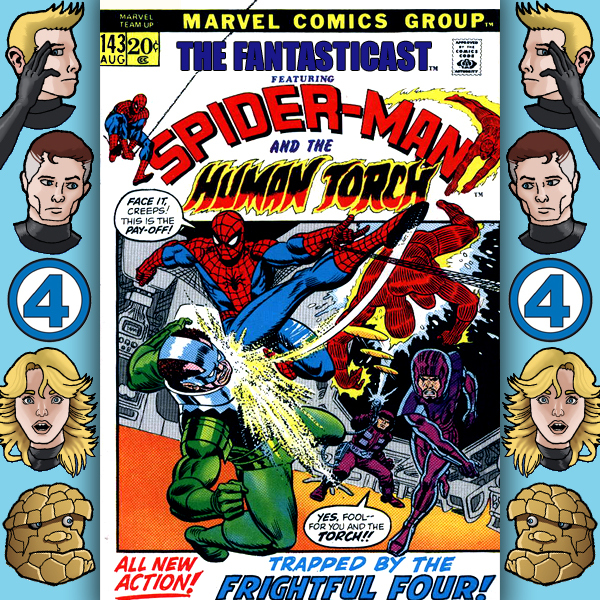 Fantastic Four #117 starts the search for Johnny Storm’s true love, with Archie Goodwin and John Buscema weaving a globe-trotting, Thing-scaring tale. We’re also looking at Sub-Mariner #44, where an evil hippie-burning Johnny Storm helps Namor against Llyra and Tiger-Shark. Finally, we’ve a brief peek at a few panels of Avengers #94, a true turning point in the Kree-Skrull War. As well as all this goodness, we present The Adventures of the Cul-De-Sac Crew, the greatest unintended consequence of Secret Wars, and Bagpuss in cosplay. As for what happens when Rita Repulsa meets the Sub-Mariner… you won’t believe what happens next! Original artwork by Michael Georgiou. Check out his work at mikedraws.co.uk, but more importantly, head over to www.elementalmicah.com where Mike’s creator-owned comic, Elemental Micah, is currently available on a pay-what-you-want basis! And we’re back. 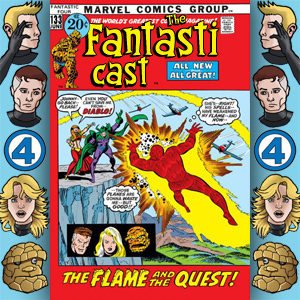 This week, Steve and Andy are joined once again by Chris Thompson of Orbital Comics in Conversation to take a look at Fantastic Four #110, and hopefully answer the question of just how Reed Richards can escape the ever-watchful eye of Annihilus in the Negative Zone. We’re also taking a brief look at Avengers #88, with plotting by SF legend Harlan Ellison. We’ve also got mention of the first credited female creator on the Fantastic Four (sort of), more ABBA than you can shake a Pierce Brosnan-shaped stick at, a radical reinterprtation of the catchiest theme tune of 2015, and a superb Harlan Ellison anecdote. Chris’s podcast backlog can be found at popculturehound.net. New episodes of Orbital Comics In Conversation can be found at http://www.orbitalcomics.com/podcast/. You can also follow Chris on twitter where he is @popculturehound. This week, we focus our gaze onto two comics, see? In Fantastic Four #91, The Thing is transported to a Star Trek episode and has to pretend that he’s not seen the series, see? Meanwhile, in Amazing Spider-Man #77, The Torch treads on Spidey’s toes as he tries to restrain the Lizard, see? With artwork from Sal Buscema, this is a rare thing – a 1960s Torch/Spidey crossover that we actually enjoy, see? We also bear withness to the strange fate of Whitey Mullins, examine the maxim ‘With Great Balls Comes Great Responsibility’, and Andy teaches Steve how to talk gangster, see? Click on this link to go to the libsyn page for this episode, or listen below, see? Send in your feedback to fantastic4podcast@gmail.com, leave your comments at the libsyn site, or below. Follow us on twitter, where we are @fantasticast, see? Original artwork by Michael Georgiou. Check out his work at mikedraws.co.uk, see? Episode cover design by Samuel Savage, see? 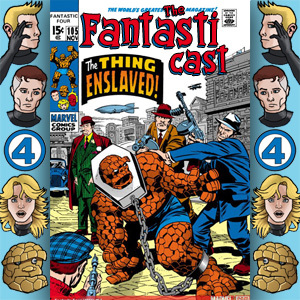 This week, we start our coverage of the last extended storyline from Stan Lee and Jack Kirby, with Fantastic Four #90: The Skrull Takes A Slave. It’s a bit more than that, though, as the issue takes some time to wrap up the previous Mole Man story as well. There’s torture, deathly danger, and some lovely new clothes for The Thing.